Here's the deal. I have a stock 69 convertible, 302, AC, 4 sp. The only modifications have been upgraded compressor, disc brakes, 4 spd (was 3 spd). My radiator took a dump and now I either need to replace or recore. I'm leaning towards a recore... 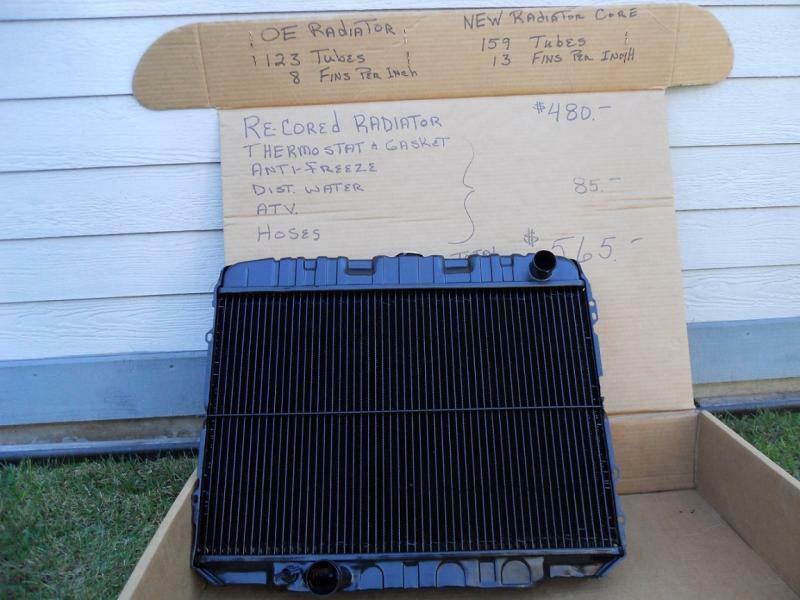 This seems to be a great price from a local radiator shop. I've read but need to verify that the recore would use better quality materials than the import rads. It really comes down to what you want. Other folks couldn't care less, and would rather have the peace of mind of a new, and probably better, modern radiator. Neither way is right or wrong, it's what makes sense to you. The recore estimate was over the phone. I dropped it off this morning and we’ll see what the shop recommends. I do agree it’s important to keep a car period correct if it hasn’t already been hacked. Hard to believe anyone still does that with all EPA regulations. We use to do it for over 50 years. If I go that route, any recommendations on which brand to get? I would like to use same mounting brackets without modifications. It sounds like your engine is mostly stock like mine. I went with this one, it 's a drop in replacement and looks stock. Works fine with my 300hp 302. Of course, radiators are like motor oil, people get passionate about them :) Decide what you want, what you need, and how much you want to spend. I would NOT recore it. The rad shops can NOT get the us made cores with the same tube size as the originals, and the cores they now use have much smaller tubes then the original rads had, so if you get one with the same amount of tubes as the one you have, it will hold LESS water and will not col as efficiently. I actually have a rad with a new us made core that i would sell if it fits your needs and your car. The only time to record is if you want all the original on the tanks. We make a very nice 2 row radiator with 1 1/4 tubes. We can sell it without the fans .